The event will gather 120+ VPs/ Directors/ Heads of Customer Experience from the sectors like BFSI, Retail, Healthcare, Export, Hospitality/ Travel agency/ Tourism / Leisure / Airlines, FMCG, E-Commerce, Telecom, Broadcasting, Logistics and Transport, Call Center. •	Market Specific Conference Sessions- With the help of senior executives we have crafted a very fine array of sessions reflecting strategic issues that have been identified as priorities. 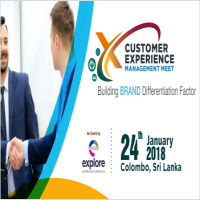 •	Cutting Edge Insight- Connect with the fraternity of leading minds in customer experience to get more inputs on the latest updates, techniques and solutions trending around the globe. •	Customer Centric Approach- Get enlightened on where you are on your CX roadmap and set a plan of action for progression. •	Networking Opportunities- Make some new connections! Swap some business cards and get your face out there in our networking breaks. •	One-to-One Business Meetings: A unique platform offering 30 minutes of pre scheduled business oriented meetings with specialists, whose industry knowledge and experience enable valuable contribution to the requirements of your business, understand their capabilities and align on potential collaborations.